Just select the amount you want to give from the drop down menu below. If you want to give an amount not shown - then do the maths and load them into your basket. So if you want to give £30, for example, select £5 then £25 and hey presto = £30. Then let us know what message you would like on the voucher. 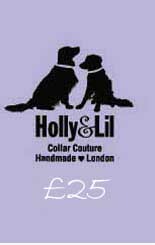 We will then create a code for your gift voucher recipient to use online or they can call us at H&L to redeem it.